The thing about me experimenting with an idea to try to come up with a healthy alternative is that I can get super excited about the result – but then immediately question, “Will this taste as good to other people as I think it tastes? Will others who are used to the ‘real version’ think this only tastes like a so-so ‘healthy version? 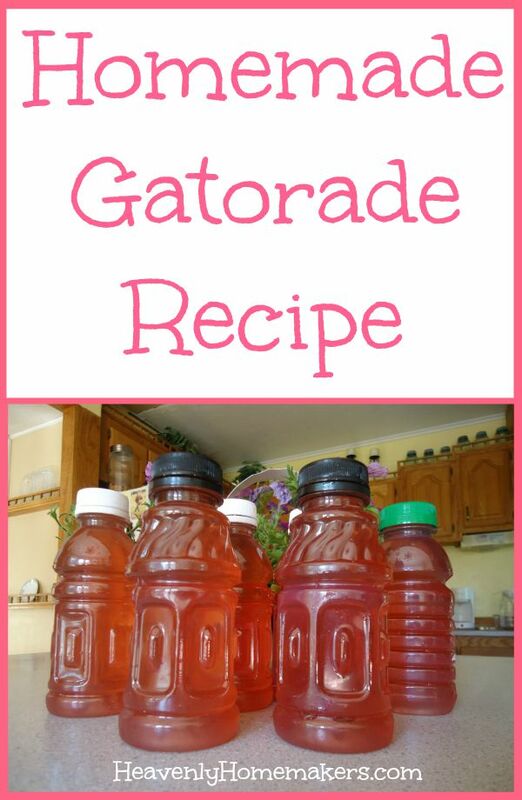 '” These questions were especially tricky when making a Gatorade alternative because 1) I haven’t actually sipped on any Gatorade for several years so I couldn’t even remember what it was supposed to taste like and 2) the homemade version looked so cute in my recycled juice bottles that I was going to be super disappointed if my kids didn’t like it. It’s all about the cute bottles. Am I right? So there I was with my “I really need my men to love this Gatorade in cute bottles” conundrum. I had the bottles nicely chilled so that they were good and frosty on the outside, enhancing their cuteness and curb appeal. Hoping for the best, I drove the bottles across town to where my entire family was working on a roof. See, my family can talk about sweat right before eating lunch and it’s not a big deal. We are a family of men (except for me) and I’ve learned to live and breathe and talk all things gross. I only brought it up here because in all fairness, Gatorade truly does give a body some of what it needs – like sugar and salt (electrolytes) – to replenish after sweating. It’s just all the other junk in Gatorade I’m trying to avoid. But enough about sweat and high fructose corn syrup. My pickiest kid – and also the one who loves junk food more than all the others – pulled out a bottle first. I held my breath. This would be the biggest test, because if this boy liked it, they should all like it. He took a sip, said “Hmm,” then took another sip. 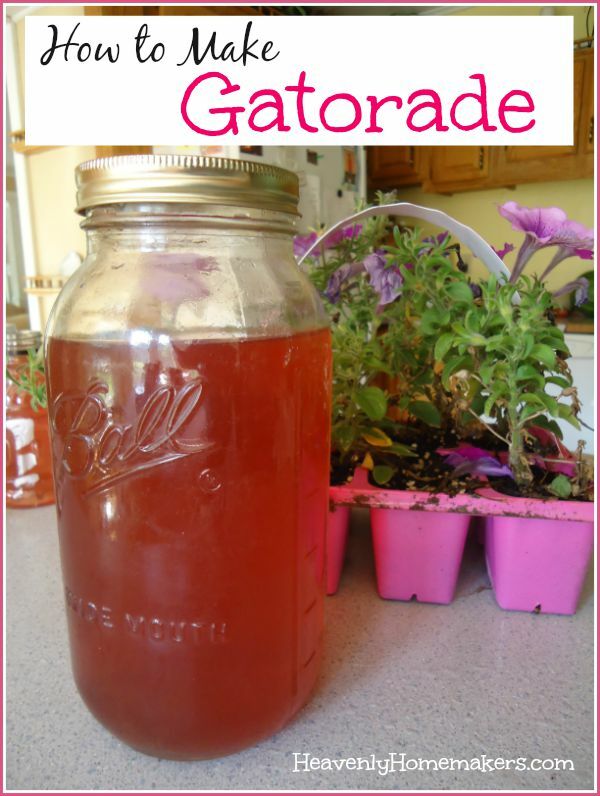 After considering the taste for a moment he said the best sentence of all, “If I didn’t know it was homemade, I would think it was real Gatorade.” Had he not been so sweaty, I would have kissed him. Instead I shrugged and said calmly as if it didn’t really matter to me, “REALLY, FOR REAL?! YOU REALLY THINK SO? I WAS REALLY REALLY HOPING YOU’D LIKE IT!!! !” He just kept sipping, then also dug into the cooler for some lunch, because he is a boy and doesn’t understand the importance of the cute bottle. So make this. Use it to quench the thirst and bless the bodies of all those around you who do sports or other activities in which they need replenishing and refreshment. In a saucepan stir juice, honey, and sea salt over medium heat until the honey and salt dissolve. Pour mixture into 6 cups of cold water. Chill mixture in the fridge until ready to serve. I’m not sure about the exact math on this recipe, but I would venture a guess that it takes about 50¢ to make this (almost a half gallon). 50¢ divided by five 10-ounce bottles is 10¢ per bottle. Store-bought Gatorade costs quite a bit more than that, plus it is full of ingredients our bodies don’t need. 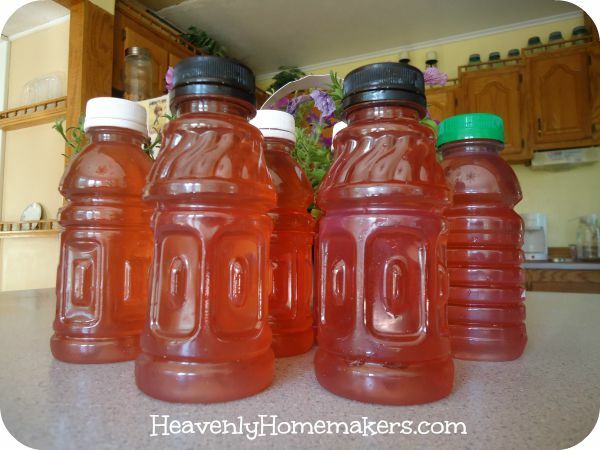 That, along with the cute bottles, should make you eager to try this recipe. We love saving money on the good stuff! Join the Homemaker’s Savings Club so I can let you know about the best prices and freebies I find each week! 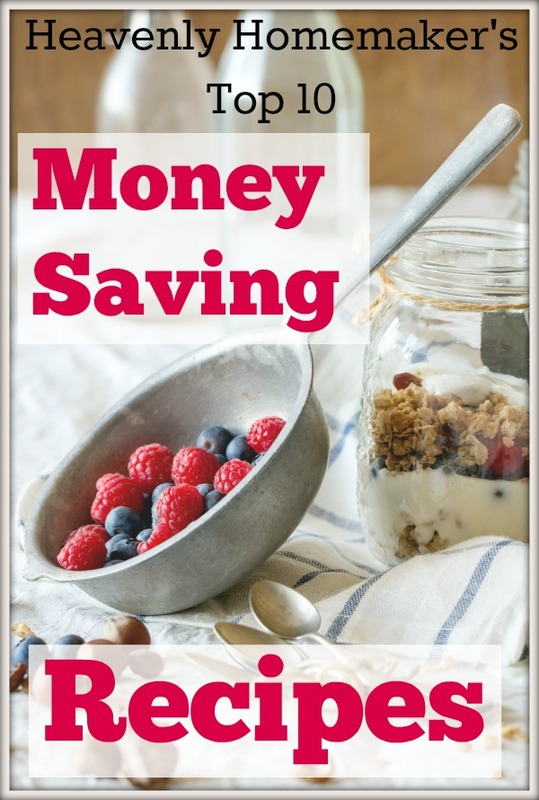 We’ll start you off with a FREE Money-Saving Cookbook just for signing up!